Dr. Naushad Shaik is an experienced Cardiac Electrophysiologist and Cardiologist who joined Cardiovascular associates in 2009. He specializes in performing complex ablation procedures for arrhythmias which include supraventricular arrhythmias, atrial fibrillation and ventricular arrhythmias, device implantations- pacemakers and defibrillators. Dr Shaik earned his medical degree at Al- Ameem Medical College in India and developed his interest in Cardiology during his Internal medicine residency at Mercy Catholic Medical Center in Philadelphia, PA. He then completed his fellowship in Cardiology at the University of Texas Medical School in Houston. 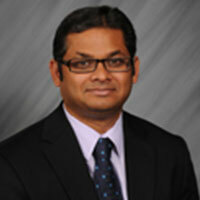 He then next undertook an advanced two-year Clinical Cardiac Electrophysiology fellowship at Emory School of Medicine in Atlanta, GA.
His academic roles include serving as a Clinical Assistant Professor of Internal Medicine at the University of Central Florida School of Medicine in Orlando, FL. Dr Shaik is a fellow of the American College of Cardiology and the Heart Rhythm Society.